The Marine Industry is one of the most severe industries to test surfaces for corrosion and waterproofing. Speedliner can be used for all surfaces such as, fibreglass, wood, aluminium and steel. Speedliner can be sprayed as a non-slip surface or a smooth shiny surface. It offers great insulation and protection in engine bays and also a sound deadening. 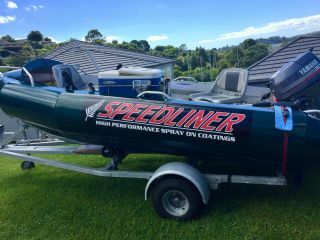 Speedliner on boat decks with a non-slip finish works well in fishing boats as it insulates noise, and easy to clean after fishing. Speedliner won’t chip or crack if you drop anything on the deck.